Madeleine and Rogan Tierney are first cousins and descendants of the great stage actress Madeleine Armin Tierney. They live with their many relatives at Arden Terrace, a gated community with large, rambling houses in Yonkers, and as the youngest cousins they are the closest--so close that they share a connection no one else could ever comprehend, and ultimately fall in love. Encouraged by their glamorous Aunt Kate to pursue their legacy in theater, the two participate in their school's production of Twelfth Night, which causes all sorts of feelings and emotions to swell, and forces Madeleine and Rogan to face the uncertainty of their future together. Illyria's setting is rich and lush, from the depictions of how Madeleine and Rogan spent their childhoods to the details in the sprawling, decaying homes that their families inhabit. Hand's writing is indeed intense, and the relationship she builds between the cousins is full of tension and passion, especially when they share private moments in the attic of Rogan's house, watching the tiny, magical toy theater they found. It is evident through their roles in Twelfth Night that both Madeleine and Rogan possess talent for the stage, but while one of them wastes it, the other embraces it, cleaving the two and showing them each very different futures. Though more practical-minded readers may have a hard time grasping the point of this short novel, Hand's writing is beautiful and her imagery vivid. Like any great tragedy, Illyria is haunting and gorgeous. Cover Comments: I love this cover. With the mist and the dark lighting, the image looks mystical and romantic, but just dark enough to give you a foreboding feeling. The title treatment is really neat looking as well. This is an excellent cover! The cover looks absolutely gorgeous! And the book summary is just as compelling! This novel sounds spell-binding. Thanks for the postive review! 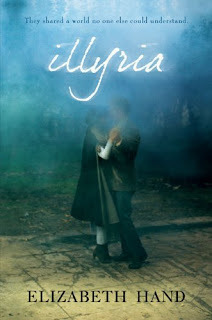 I'll be posting my review ILLRIA soon as well. I love E.Hand's novels... It found it interesting that it was marketed as YA because it read exactly like one of her adult books, thematically and otherwise. On the other hand, I'm thrilled that she's breaking into YA because I've loved her novels for quite some time and it gave me an opportunity to review one for the blog! Are You a Fan of Willow? Guest Blog from Kelly Link! Sea Change Summer 2010 Tour! Find Out the Truth in Jen Sturman's Second Book!